This ADA Adjustable Basketball System lets you bring the sports action down to the height of any age group. The post is made of steel, measures 5″ x 5″, and mounts to the surface of your outdoor court or playground using bolts. You can easily adjust the height of the backboard using the handle mechanism (seen to the left of the pole in the photos below). This is a perfect basketball hoop for anyone with growing kids or expecting different age groups to be using the hoop. There are various heights that the hoop can be lowered or raised to with minimal effort. The adjustable basketball system at full height. The hand crank turns easily to raise or lower the backboard. 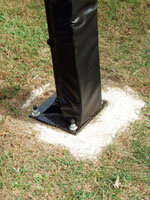 A close-up view of the base of the vertical post, with optional post padding. Got questions about the special needs basketball equipment? Contact us TOLL FREE!